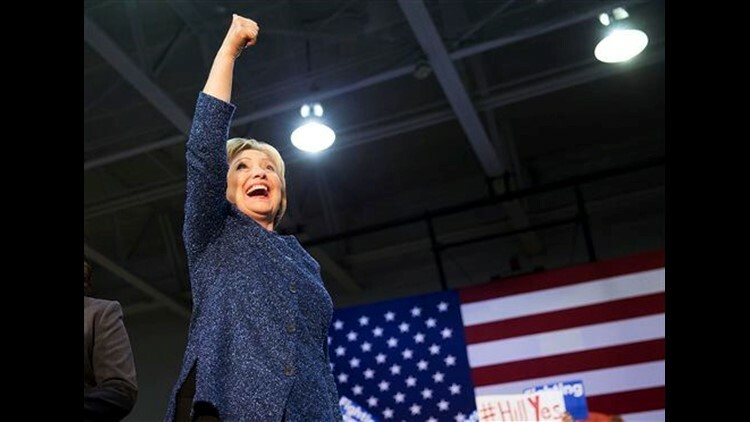 COLUMBIA, S.C. (AP) — Hillary Clinton sailed to a commanding victory over Bernie Sanders in Saturday's South Carolina primary, drawing overwhelming support from the state's black Democrats and putting her in strong position as the race barrels toward Super Tuesday's crucial contests. Clinton's win provided an important boost for her campaign — and a moment to wipe away bitter memories of her loss to Barack Obama in South Carolina eight years ago. As she makes her second White House run, Clinton has warmly embraced Obama, who remains widely popular with Democrats and particularly African-Americans. Eight in 10 black voters went for Clinton, according to early surveys from polling places. Clinton's victory came at the end of a day that saw Republican candidates firing insults at each other from Super Tuesday states. Donald Trump, working to build an insurmountable lead, was campaigning in Arkansas with former rival Chris Christie and calling Marco Rubio a "light little nothing;" Ted Cruz was asking parents in Atlanta if they would be pleased if their children spouted profanities like the brash billionaire, and Rubio was mocking Trump as a "con artist" with "the worst spray tan in America." Sanders, expecting defeat on Saturday, left South Carolina even before voting finished and turned his attention to some of the states that vote in next Tuesday's delegate-rich contests. He drew 10,000 people to a rally in Austin, a liberal bastion in conservative Texas, the biggest March 1 prize. "On Super Tuesday the state that is going to be voting for the most delegates is the great state of Texas," Sanders told the crowd at a Formula One racetrack. "If all of you come out to vote and you bring your friends and your neighbors and your co-workers, we are going to win here in Texas." While Sanders spent the end of the week outside of South Carolina, his campaign did invest heavily in the state. He had 200 paid staff on the ground and an aggressive television advertising campaign. A self-described democratic socialist, Sanders has energized young people and liberals with his impassioned calls for breaking up Wall Street banks and making tuition free at public colleges and universities. But the senator from Vermont, a state where about 1 percent of the population is black, lacks Clinton's deep ties to the African-American community. Exit polls showed 6 in 10 voters in Saturday's South Carolina primary were black. About 7 in 10 said they wanted the next president to continue Obama's policies, and only about 20 percent wanted a more liberal course of action, according to exit polls conducted by Edison Research for The Associated Press and television networks. Clinton's sweeping victory suggested South Carolina voters had put aside any lingering tensions from her heated 2008 contest with Obama. Former President Bill Clinton made statements during that campaign that were seen by some, including influential South Carolina Rep. James Clyburn, as questioning the legitimacy of the black presidential contender. This time around, Clyburn endorsed Clinton, and her husband was well-received as he traveled around the state on her behalf. She also focused extensively on issues with particular resonance in the black community, including gun violence. She held an emotional event in South Carolina with black mothers whose children died in shootings. Clinton's second White House bid lurched to an uneven start, with a narrow victory over Sanders in Iowa and a crushing loss to the senator in New Hampshire. She pulled off a 5-point win over Sanders in last week's Nevada caucus, a crucial victory that helped stem Sanders' momentum. Clinton's campaign hopes her strong showing with black voters in South Carolina foreshadows similar outcomes in states like Georgia, Alabama, Tennessee and Virginia that vote Tuesday and have large minority populations. Taken together, 865 Democratic delegates are up for grabs in the Super Tuesday contests in 11 states and American Samoa. Because Democrats apportion delegates proportionally, Sanders is simply hoping to stay close to Clinton in the South. But he's focusing most of his attention on states in the Midwest and Northeast, including his home state of Vermont. Sanders, a fierce opponent of super PACs and high-dollar campaign fundraising, has built a massive network of small donors and has the money to stay in the race deep into the spring. Still, Clinton's campaign sees a chance to build enough of a delegate lead to put the race out of reach during the sprint through March. Going into South Carolina, Clinton had just a one-delegate edge over Sanders. However, she also has a massive lead among superdelegates, the Democratic Party leaders who can vote for the candidate of their choice at this summer's national convention, regardless of how their states vote. Pace reported from Washington. Associated Press writer Catherine Lucey in Austin, Texas, and Ken Thomas in Washington contributed to this report.